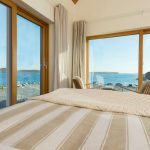 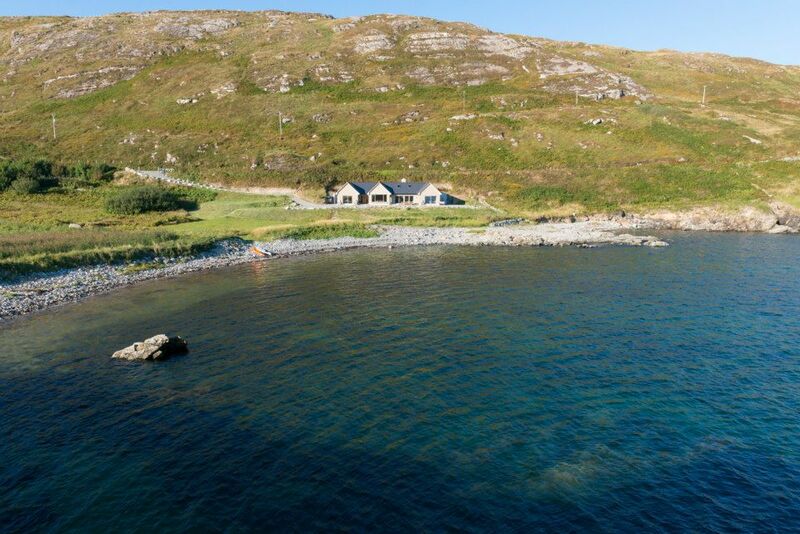 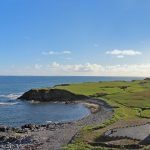 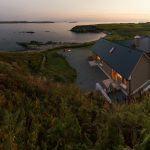 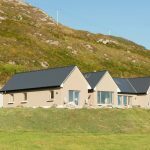 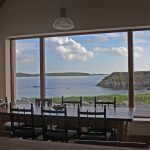 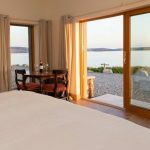 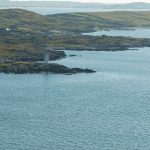 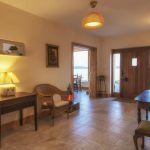 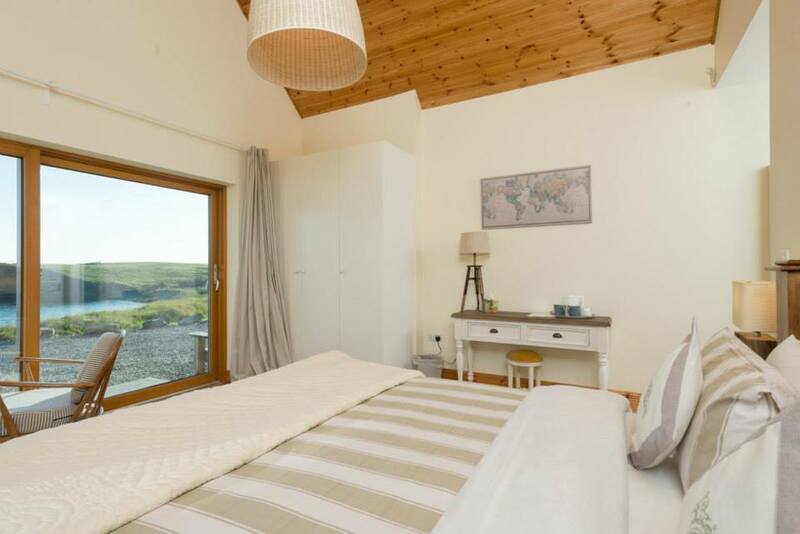 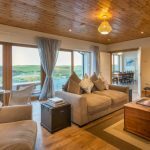 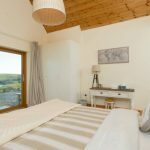 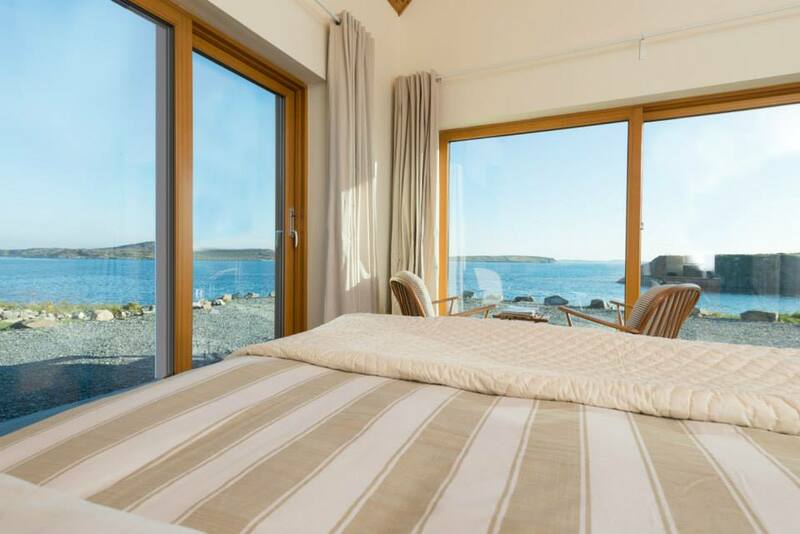 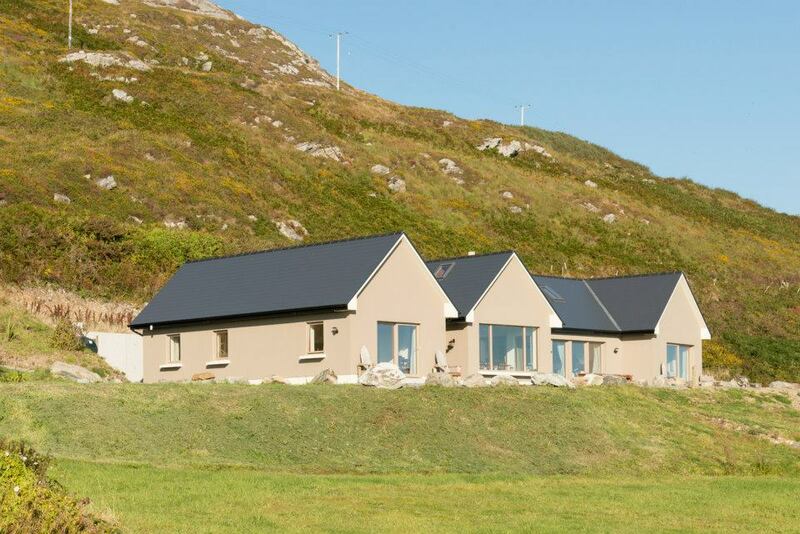 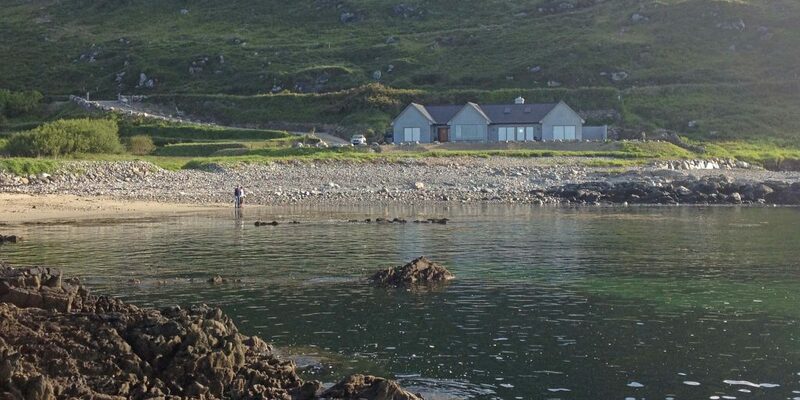 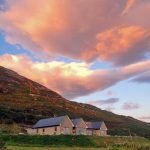 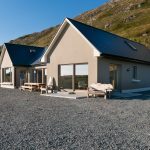 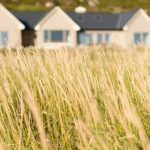 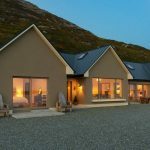 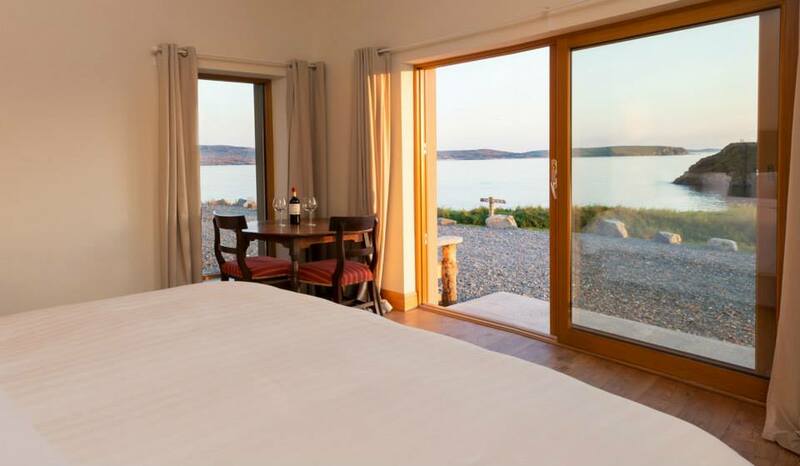 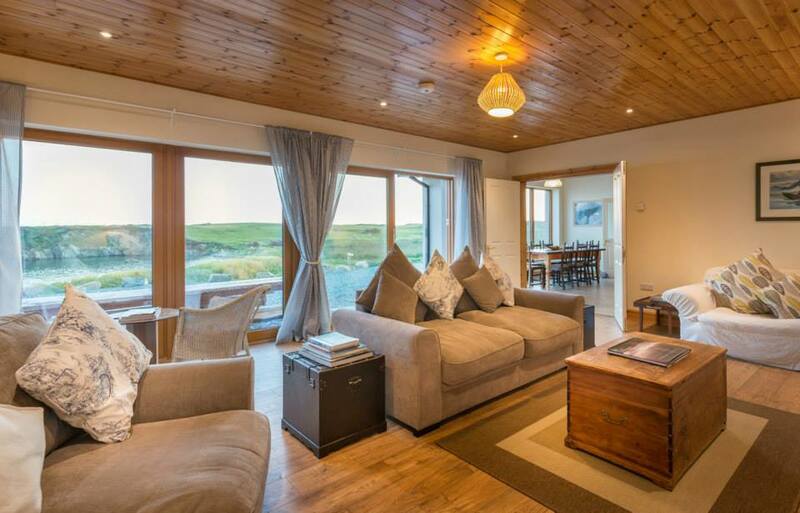 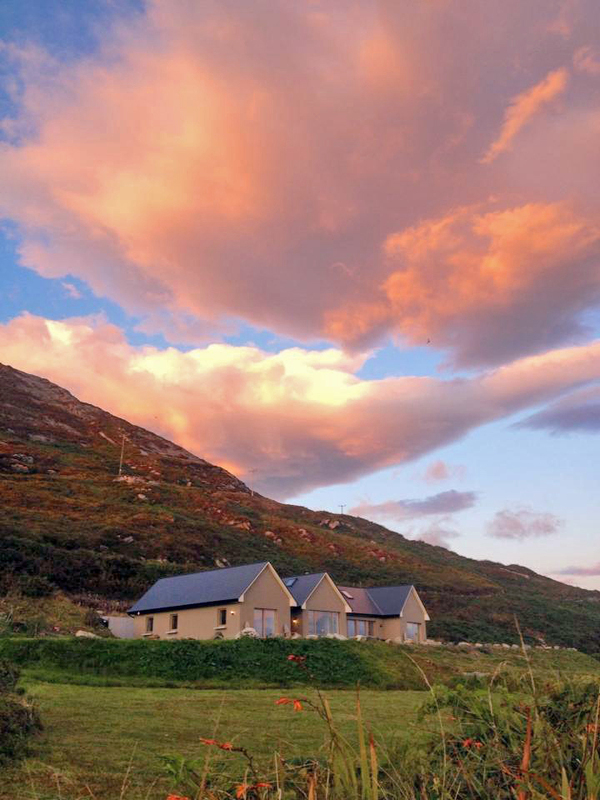 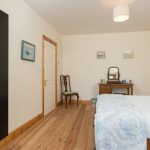 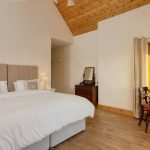 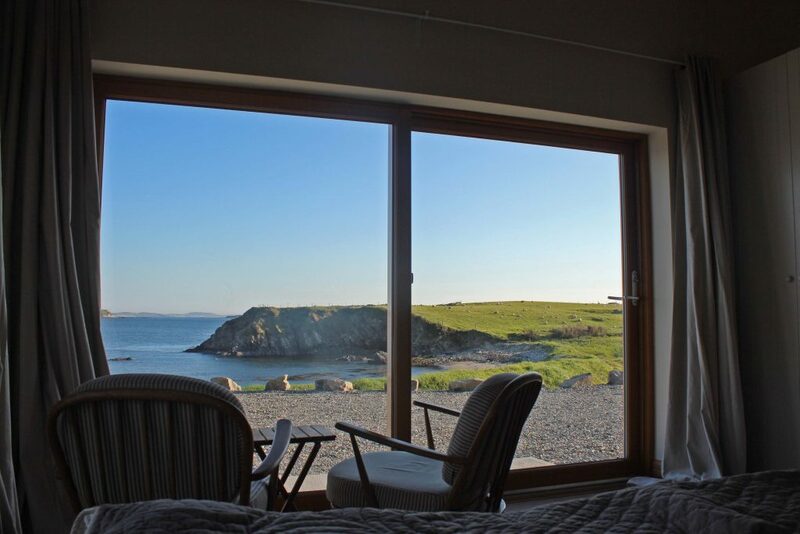 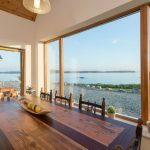 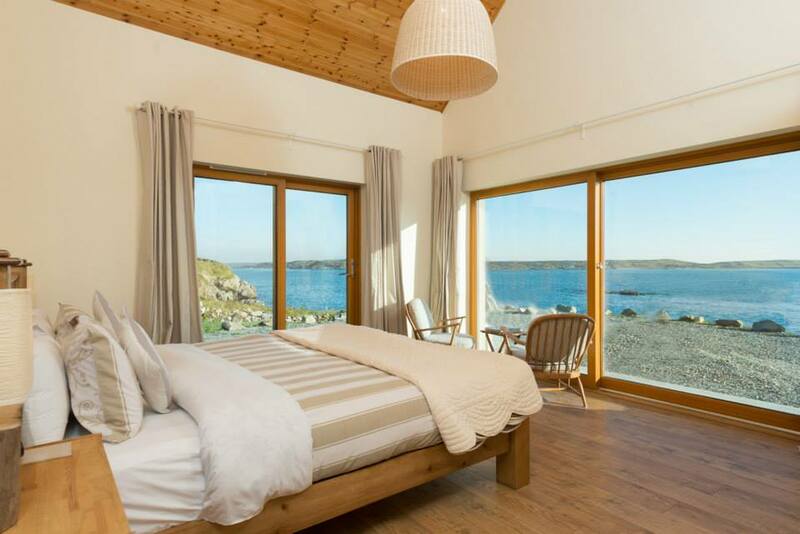 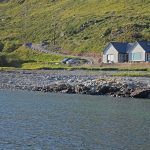 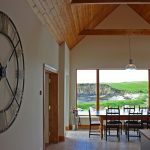 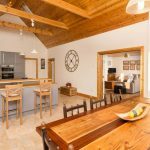 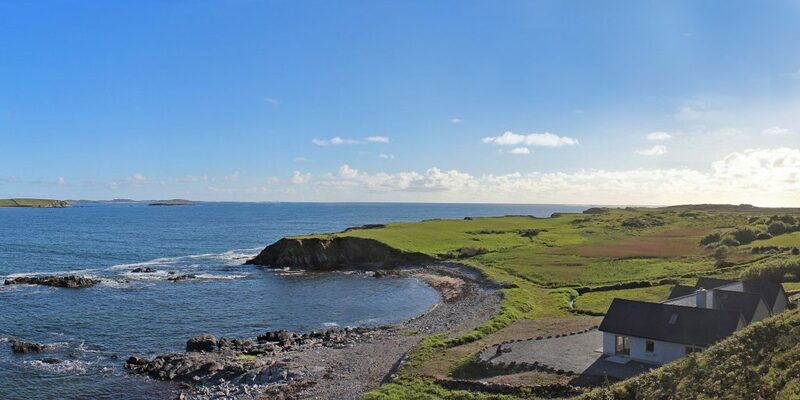 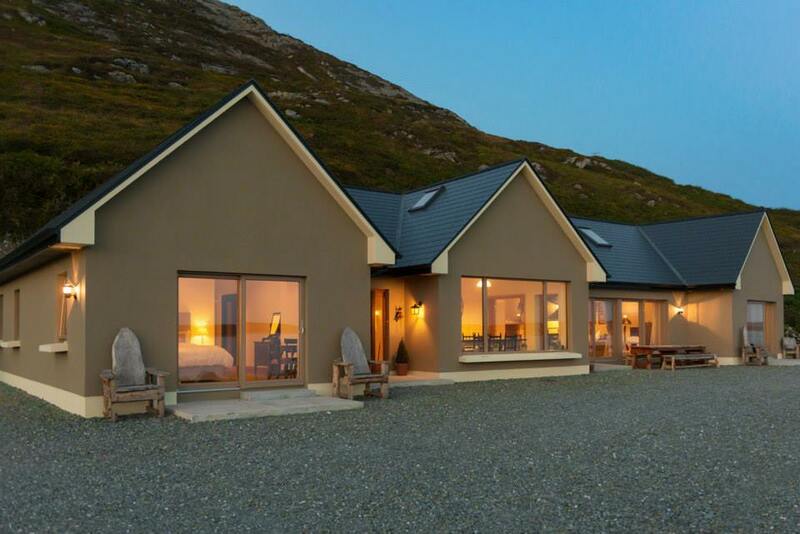 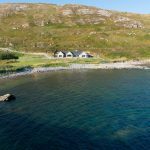 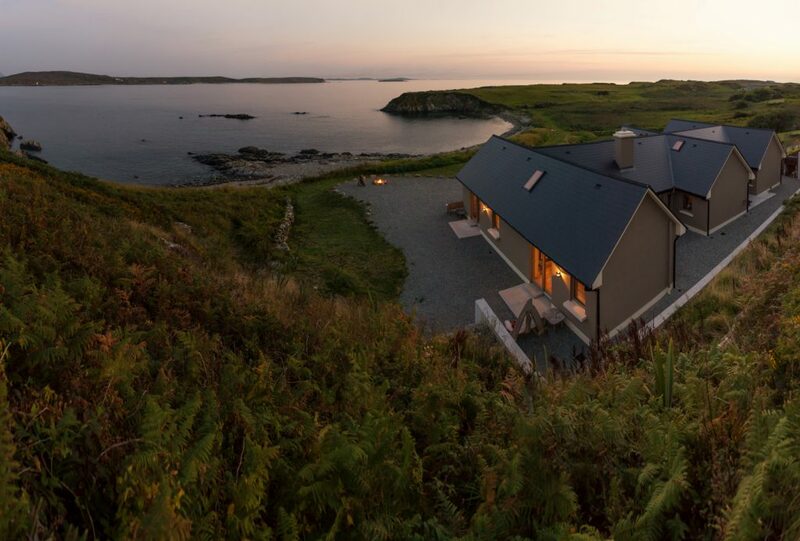 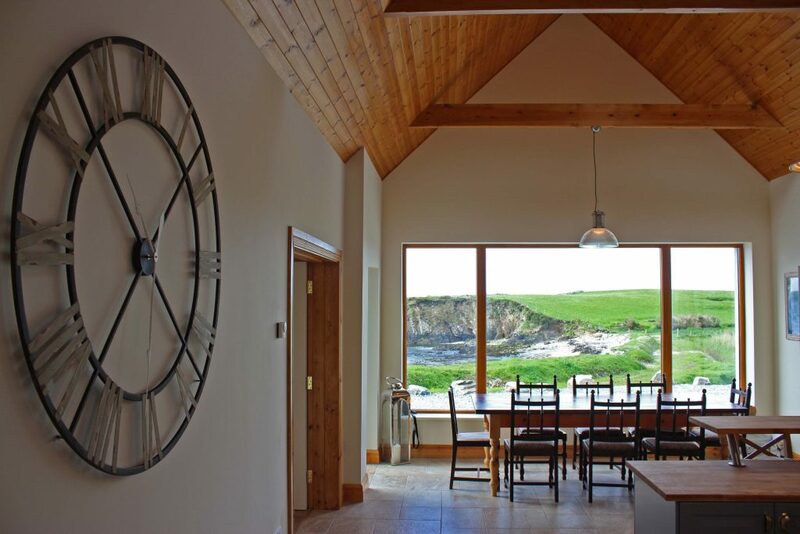 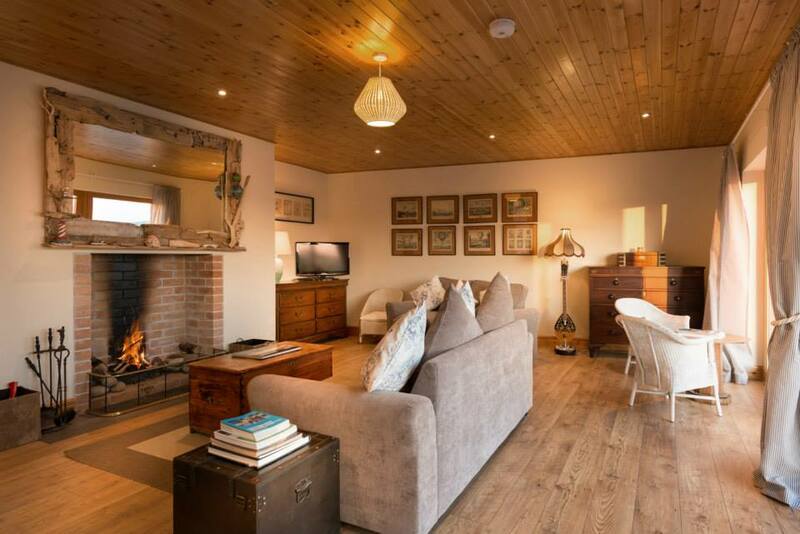 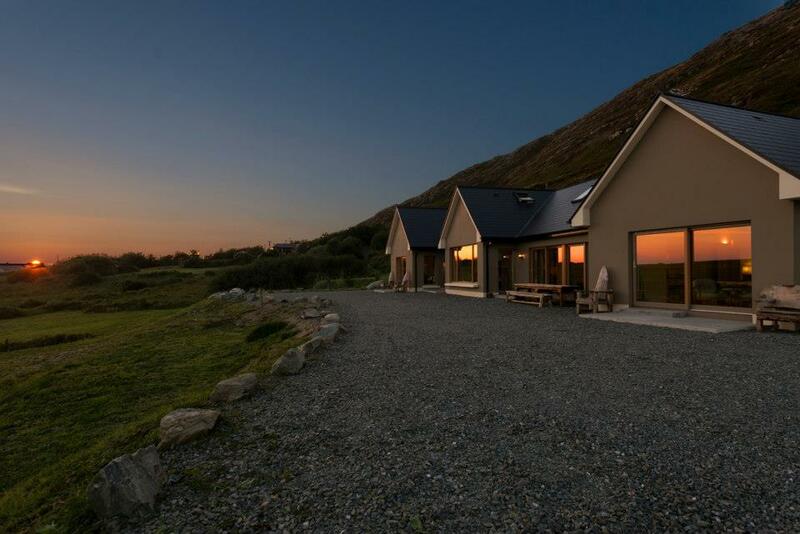 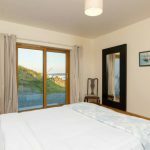 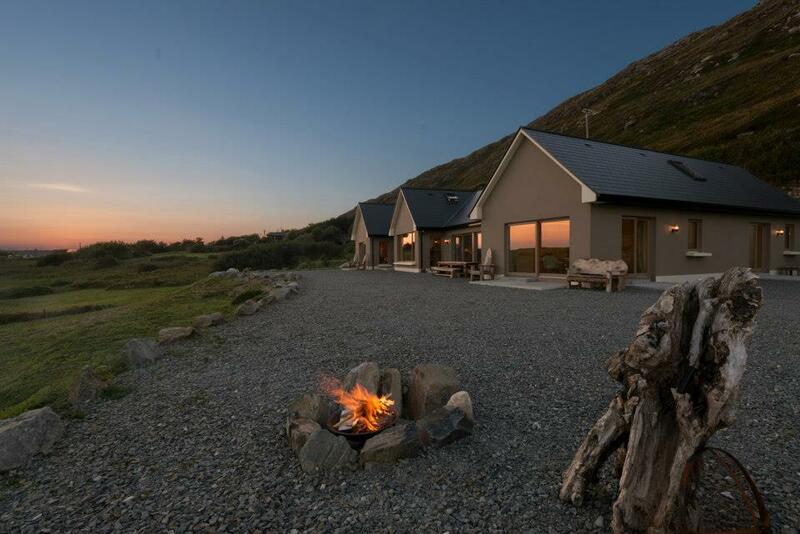 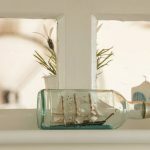 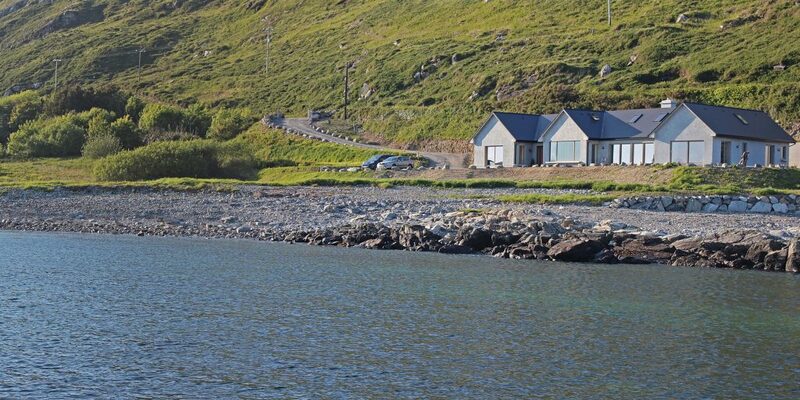 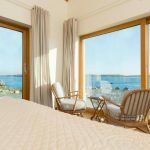 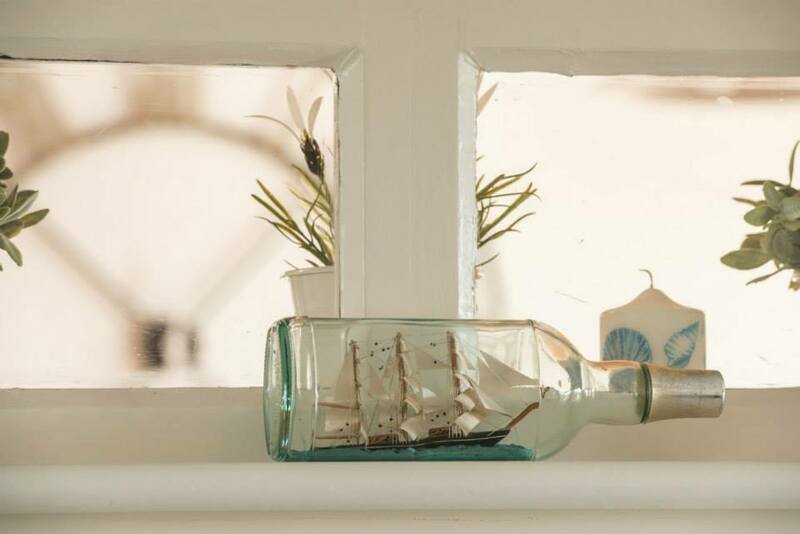 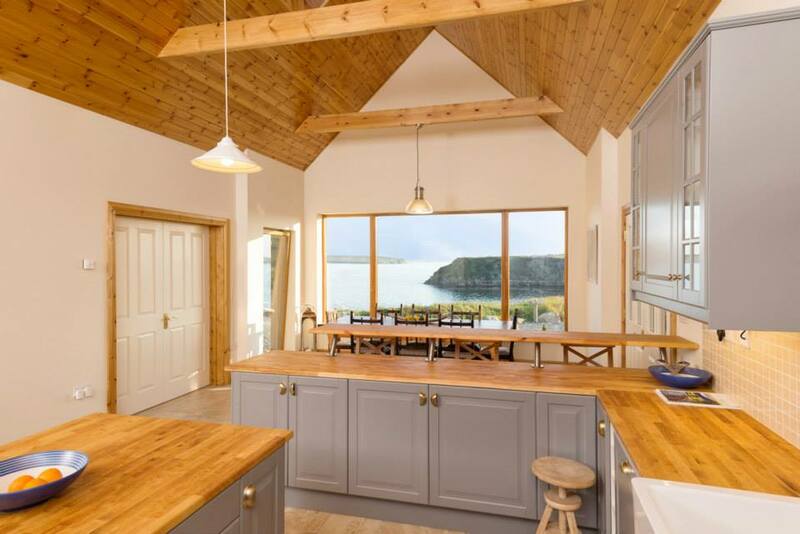 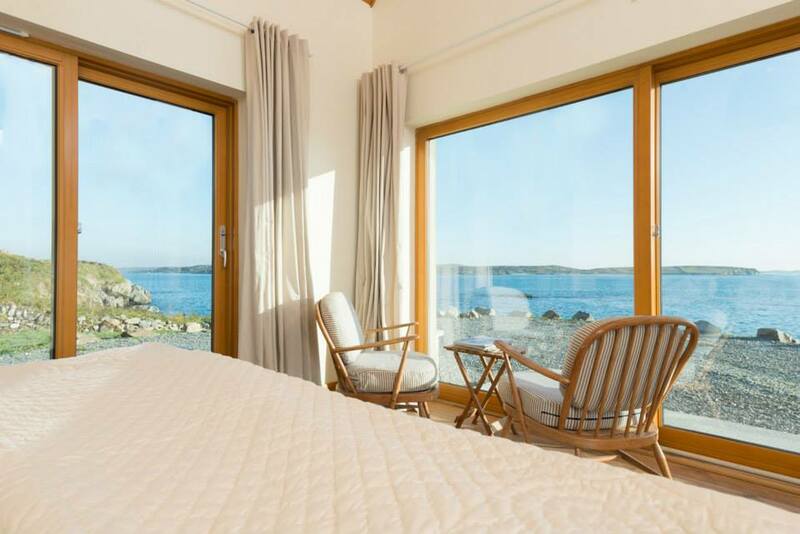 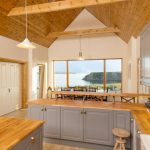 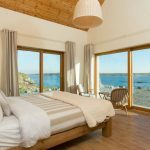 The lodge is completely rebuilt on the foundations of three 19th century famine cottages with panoramic windows which open onto an ever-changing ocean. 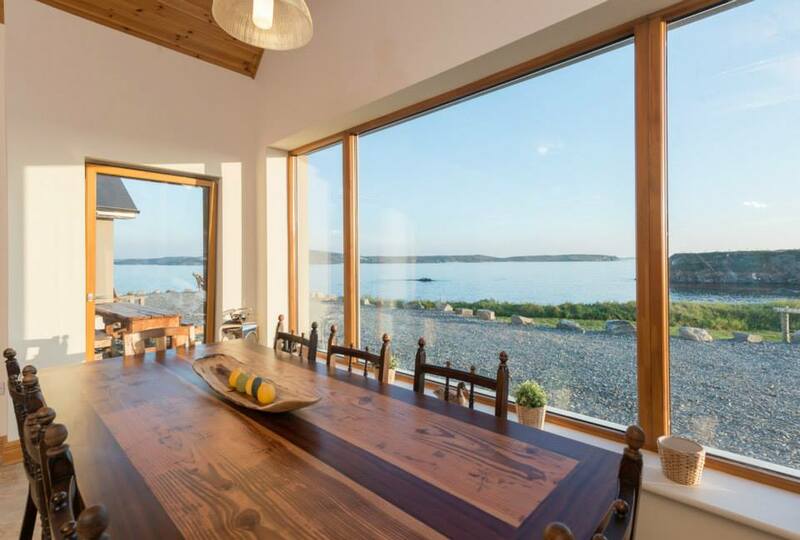 Clever design has ensured that all the main living spaces experience uninterrupted views of the bay. 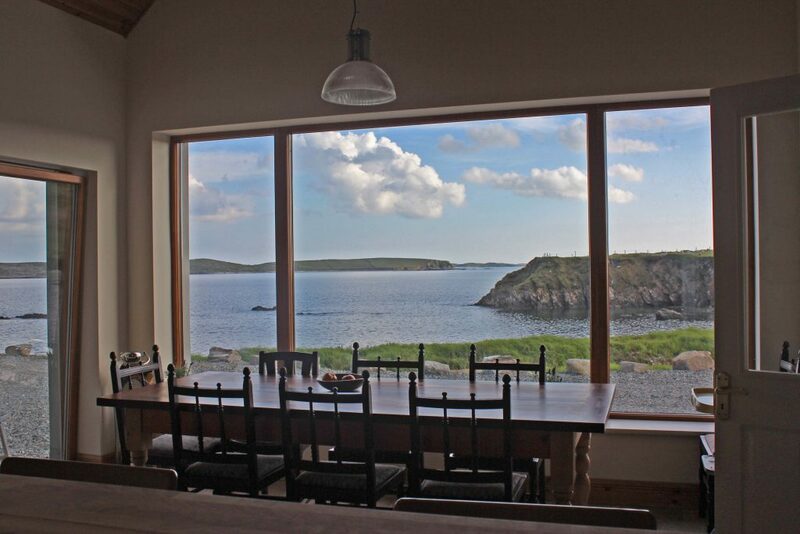 If sitting in a bay window with views on three sides is not close enough to nature, and if the weather is behaving itself, you can slip through the glass doors and dine al-fresco from the grand rustic refectory table. 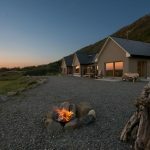 Curl up in front of a roaring open fire with a glass of hearty red and nothing but the sound of crashing waves on the shore in the background, or slide back the large glass doors, breathe in that salty air, and throw another mackerel on the barbecue. 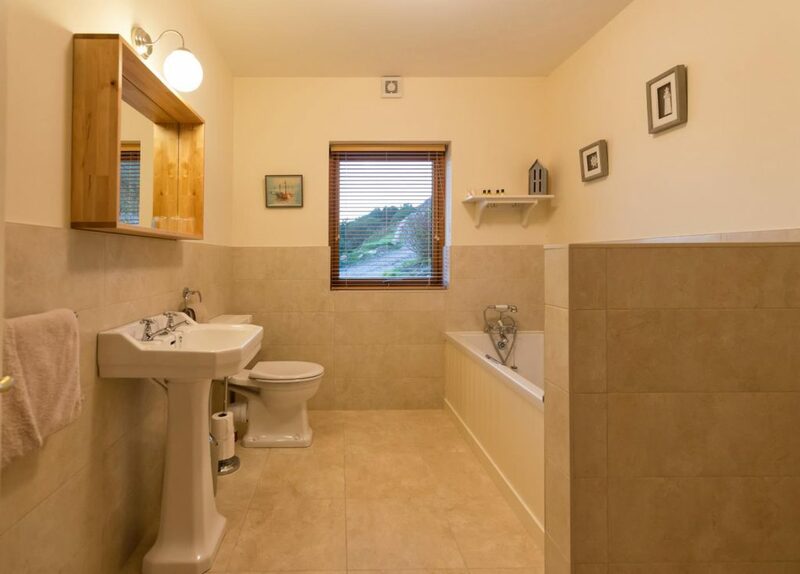 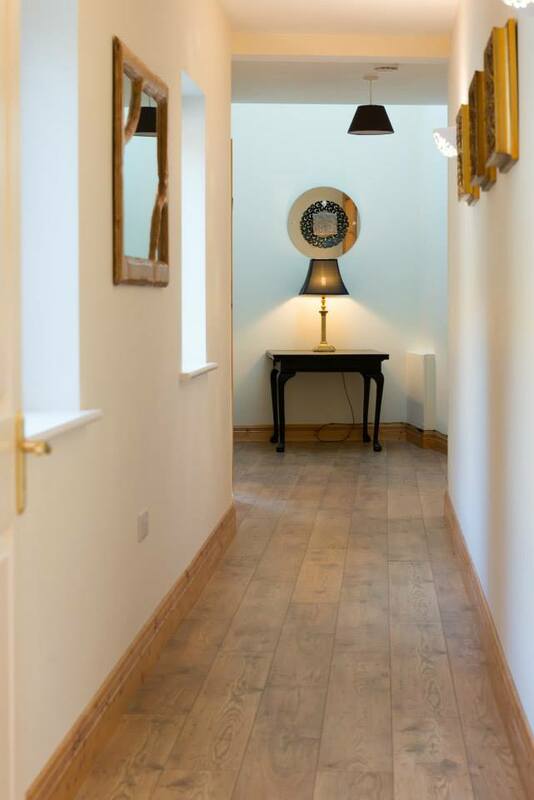 Neutral colours, warm pine panelling and under floor heating feature here and throughout the home. 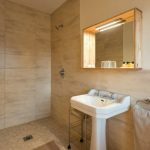 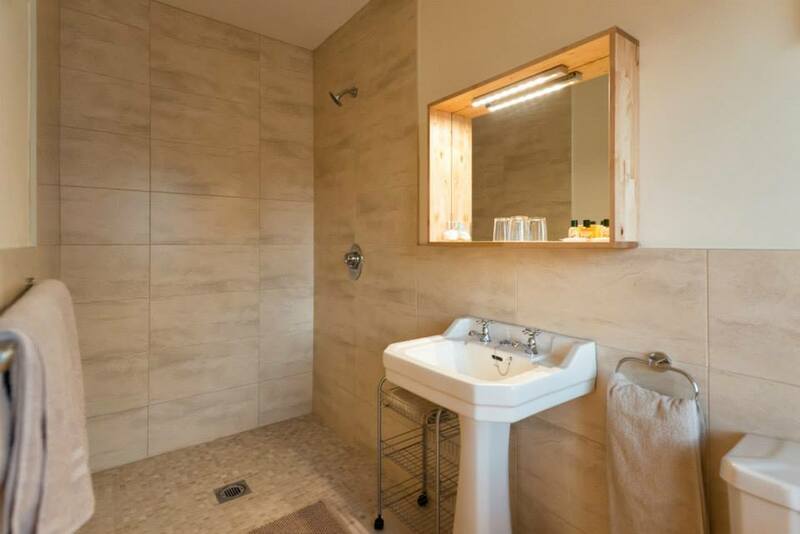 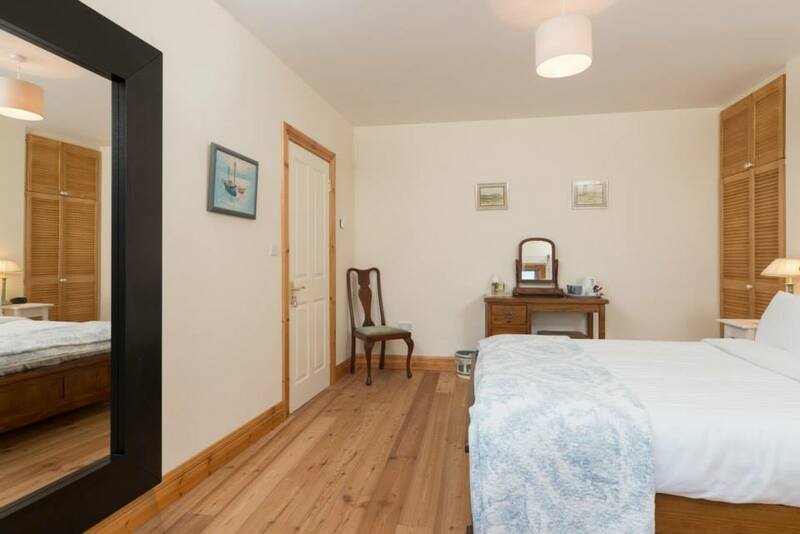 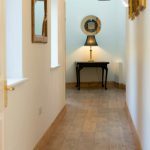 All the bedrooms are en-suite with stylish modern bathrooms and mosaic tiled floors. 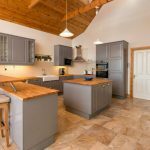 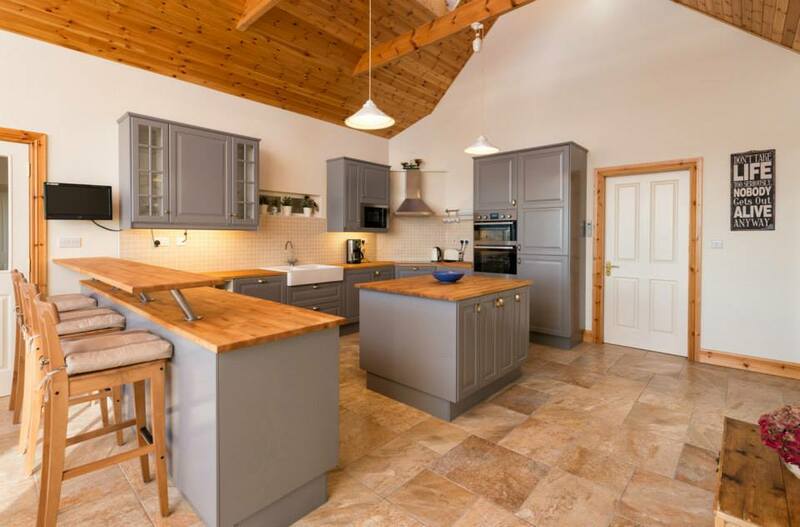 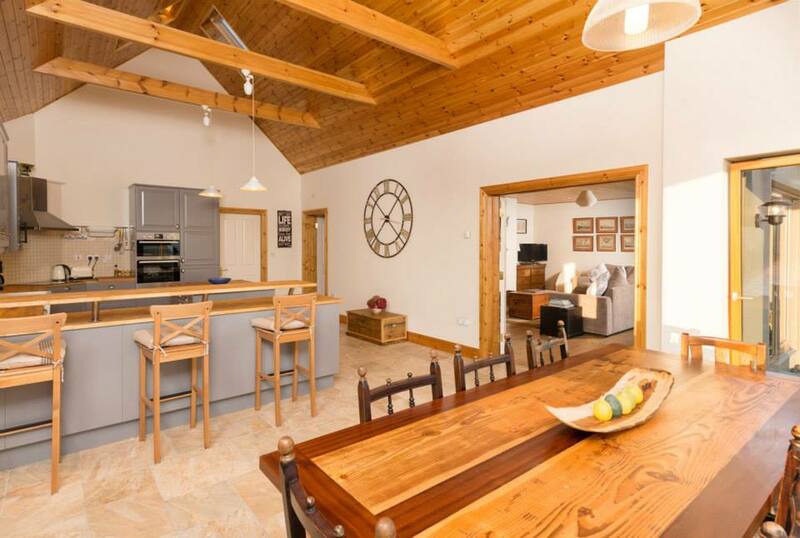 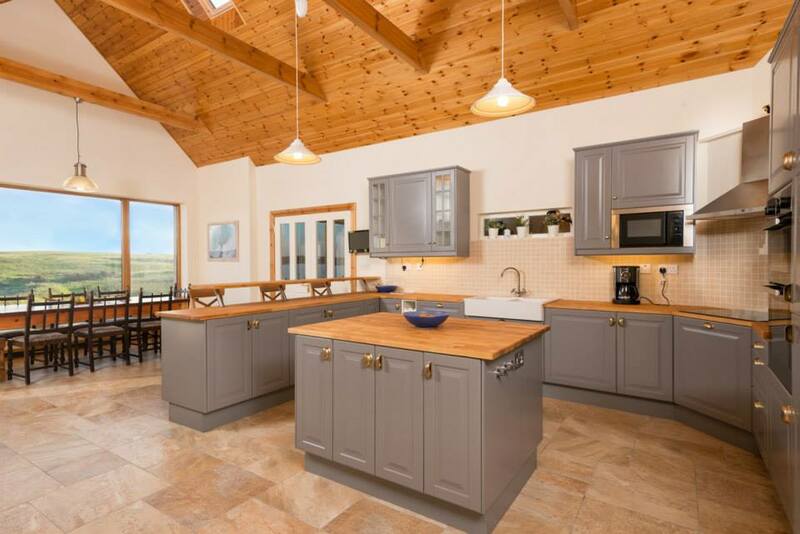 The lodge, located on the same property as our B&B is entirely self-catering. 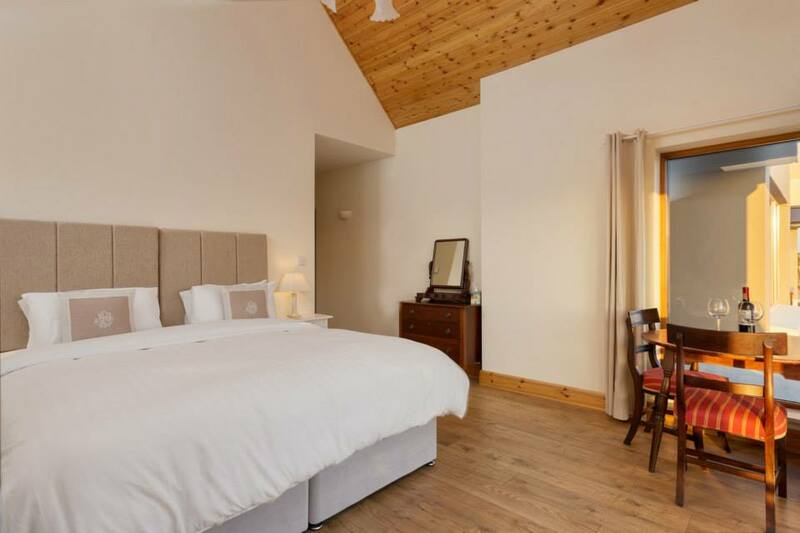 During the high season (summer) the lodge has a minimum stay of one week. 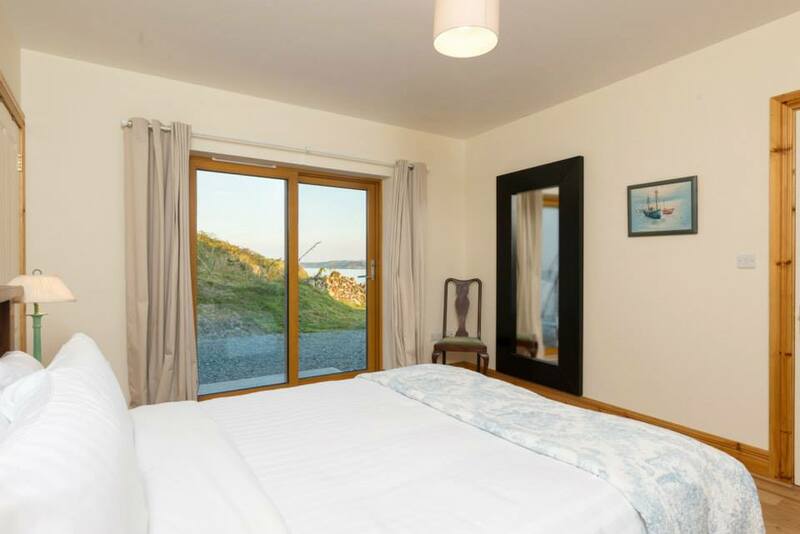 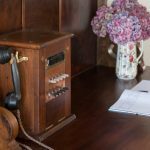 Outside of the summer season, we do offer mid-week and weekend bookings. 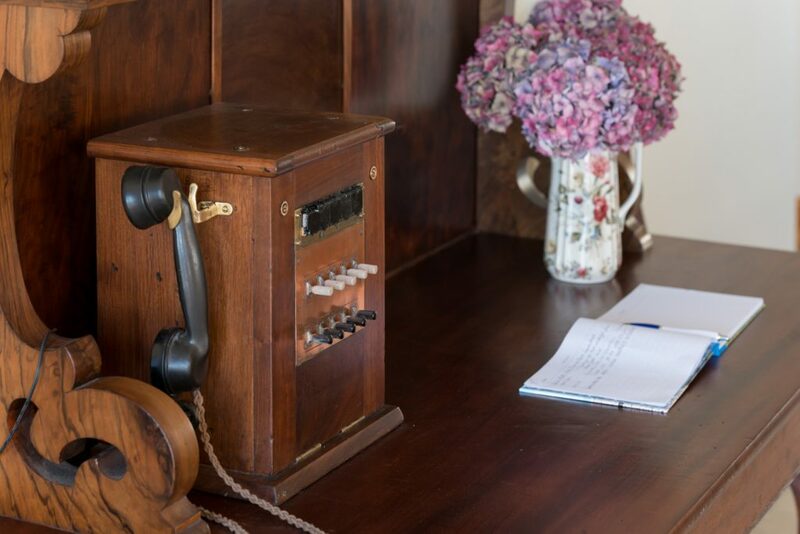 For all other dates, or specific queries, please email us directly at stay@dolphinbeachhouse.com. 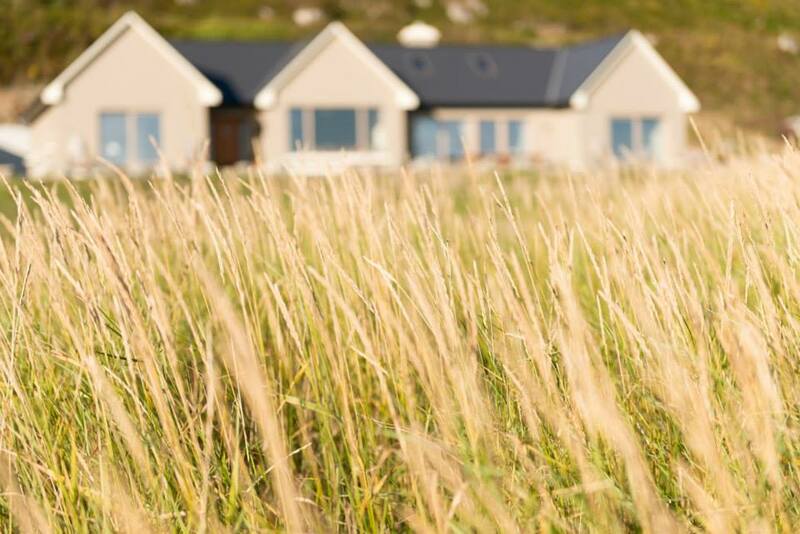 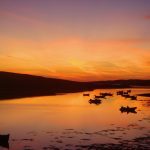 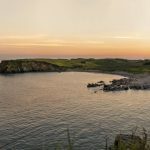 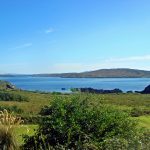 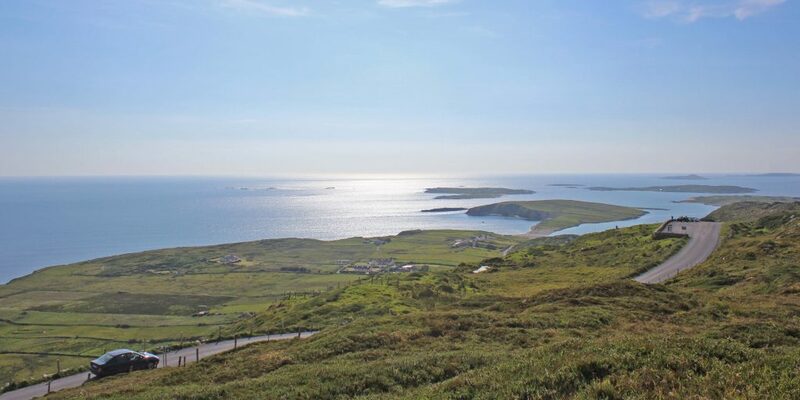 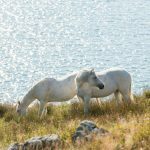 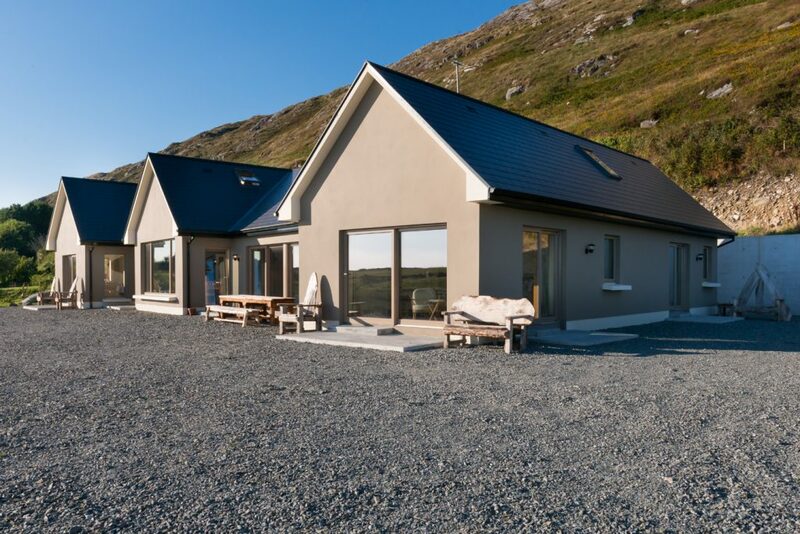 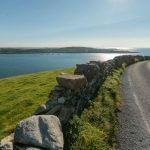 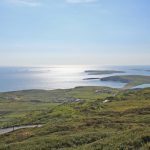 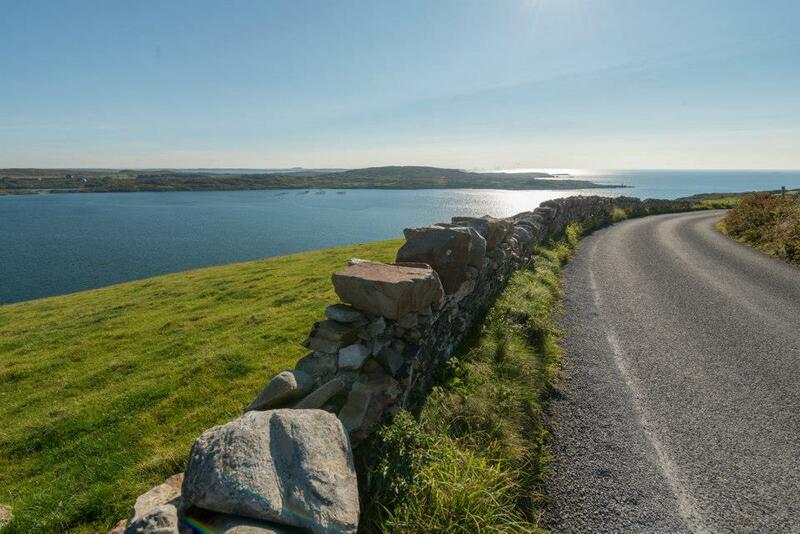 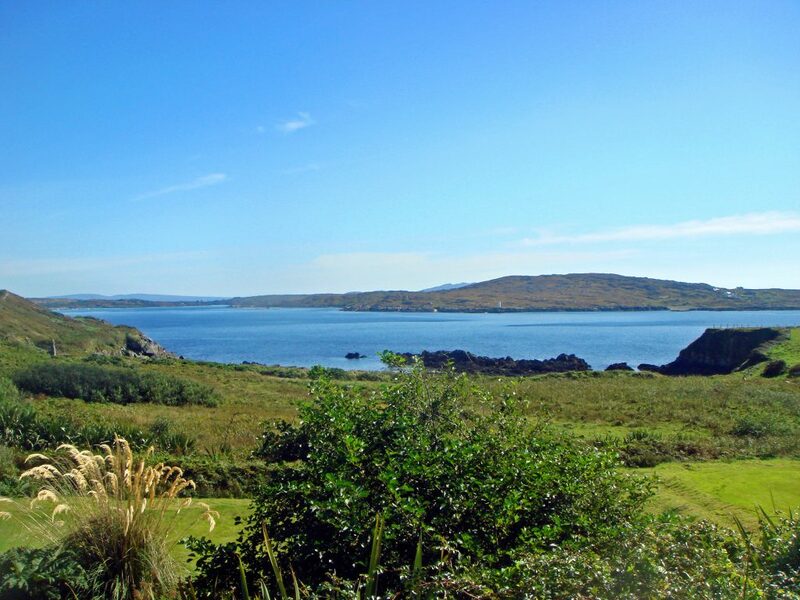 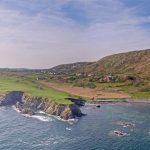 Just 3 miles away from Dolphin Beach Lodge, is the bustling town of Clifden, otherwise known as the capital of Connemara. 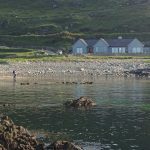 It enjoys an authentic social scene with quality restaurants and quaint pubs where traditional Irish music sessions add to a lively atmosphere. 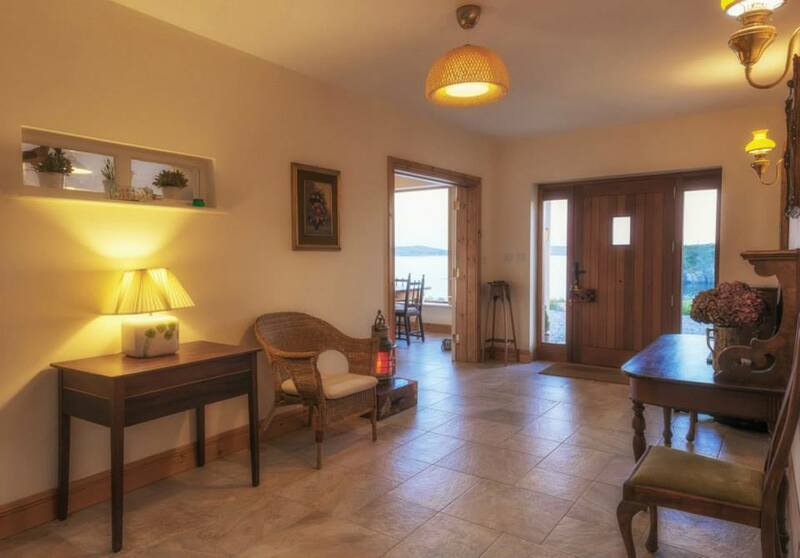 For a more contemporary void Mullarkeys’ pub has live jazz and blues. 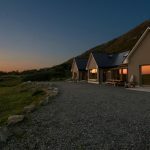 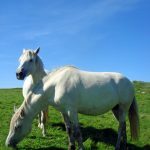 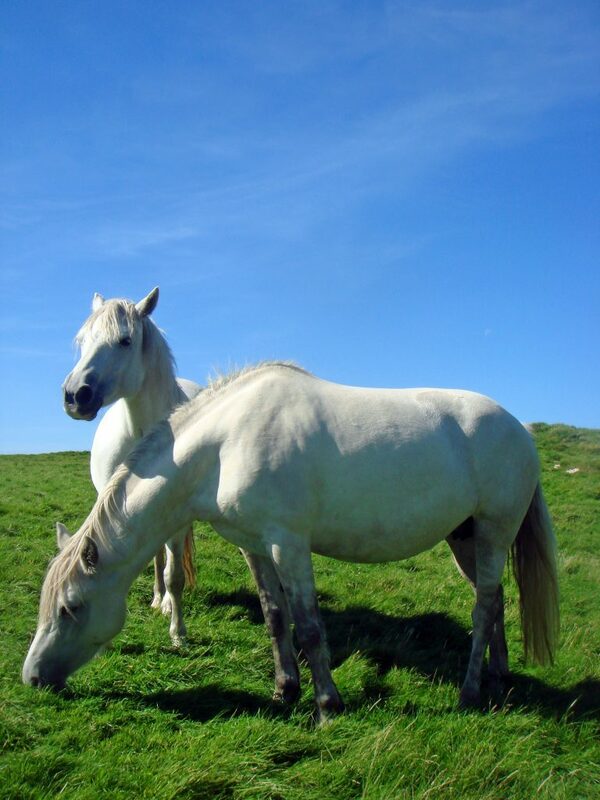 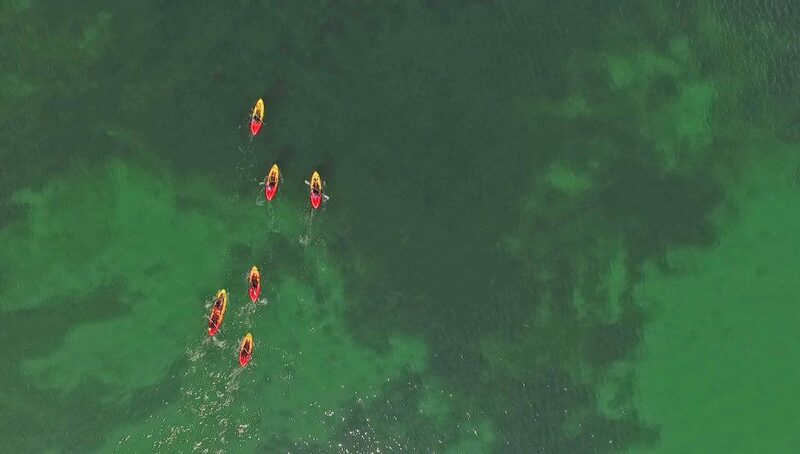 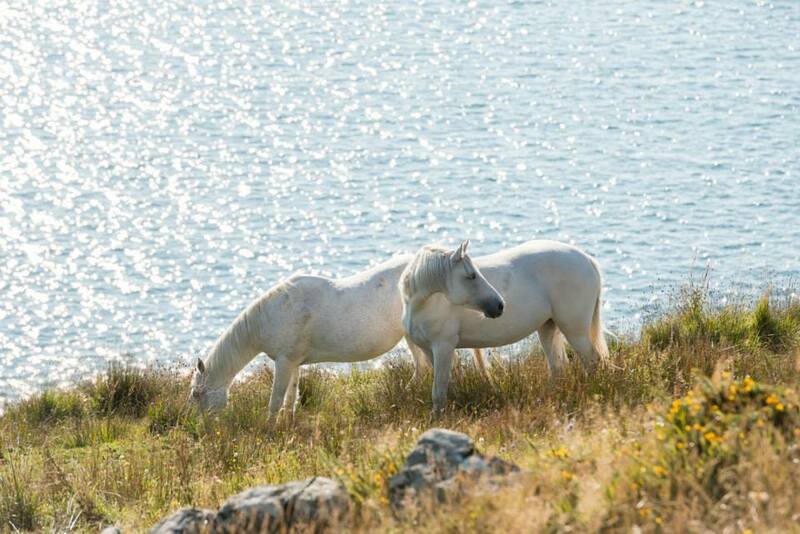 The surrounding area is unparalleled in beauty with stunning white sandy beaches and vast empty landscapes of mountain and ocean, with a primary focus for many tourists and locals alike, being the captivating Connemara National Park which is a 30 minute drive from Dolphin Beach. 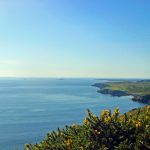 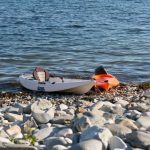 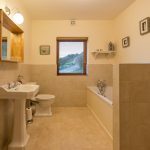 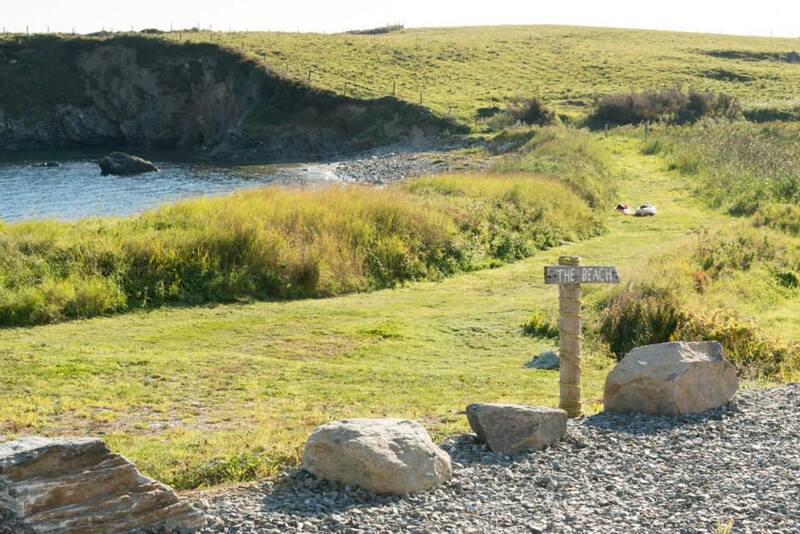 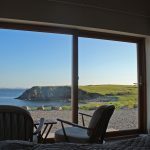 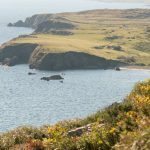 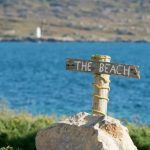 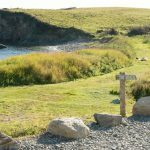 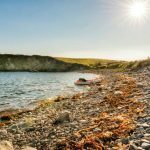 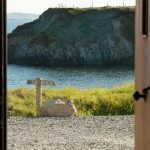 The lodge is literally a stone’s throw from the pebbly beach, and a short walk through the garden finds a small sandy cove which is safe for swimming. 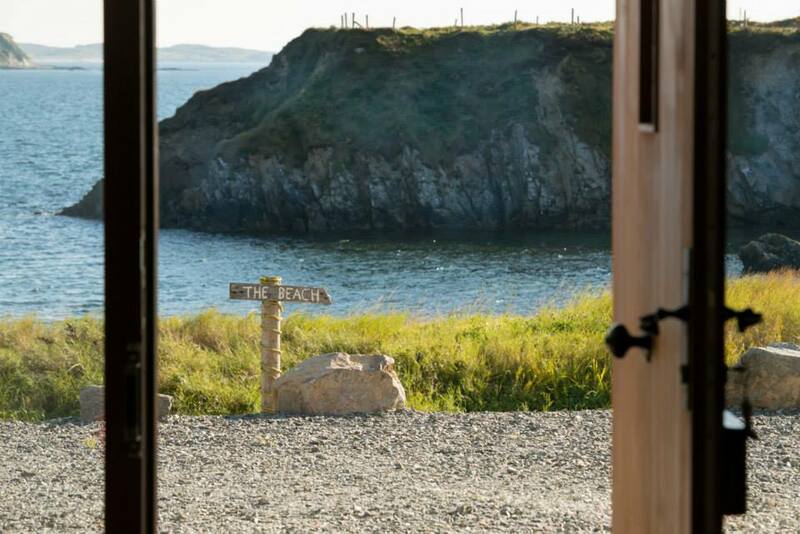 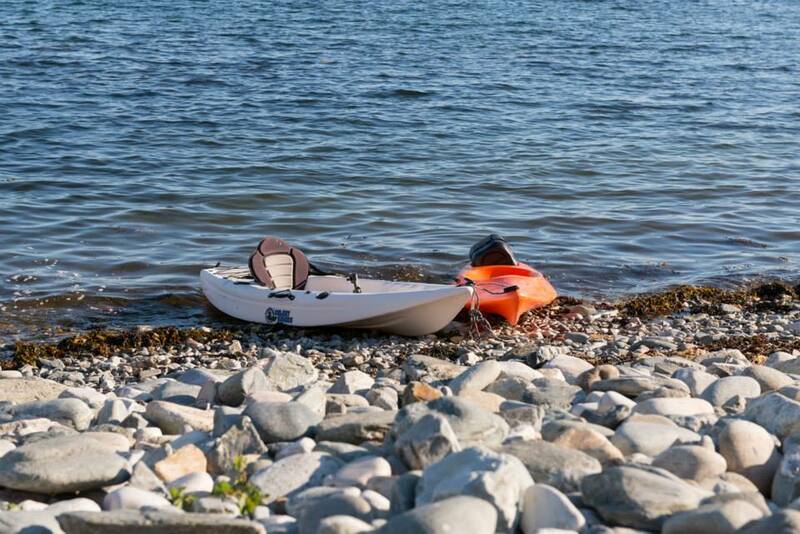 There are 14 acres of natural secluded landscape surrounding the house with limitless opportunities for walking or kayaking, fishing or painting – whatever takes your fancy really. 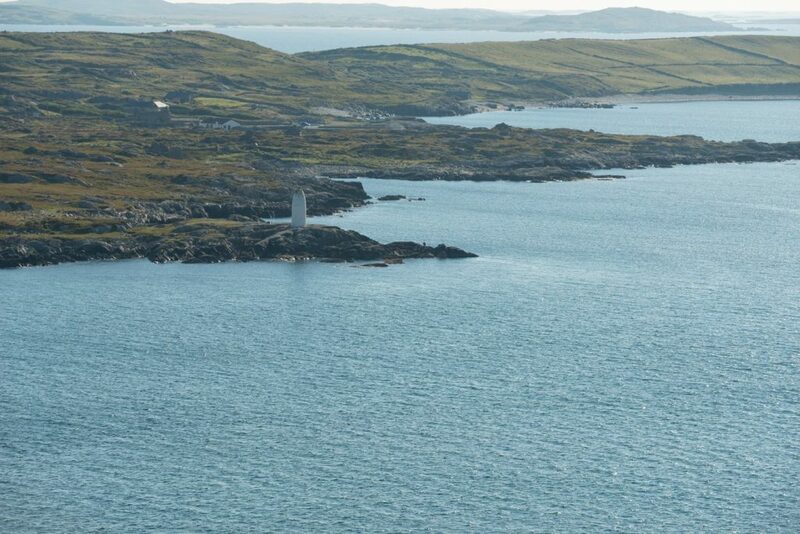 This is a part of the world where the whims of the Atlantic prevail. 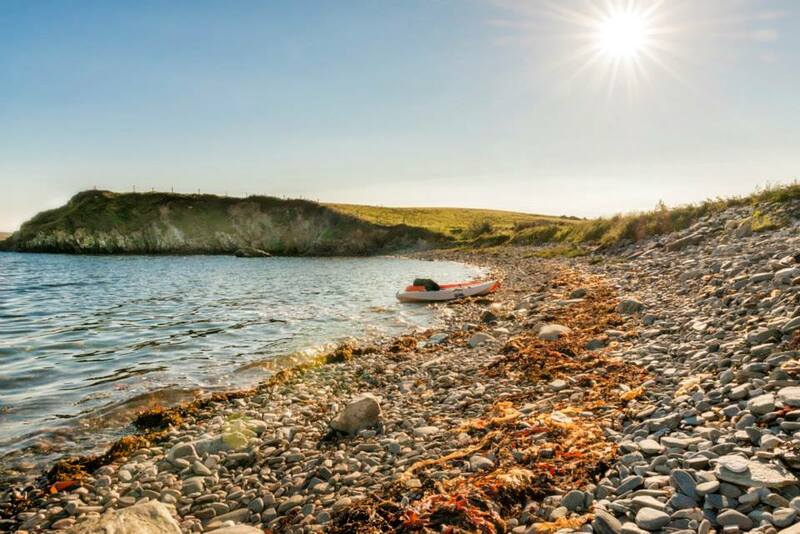 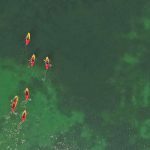 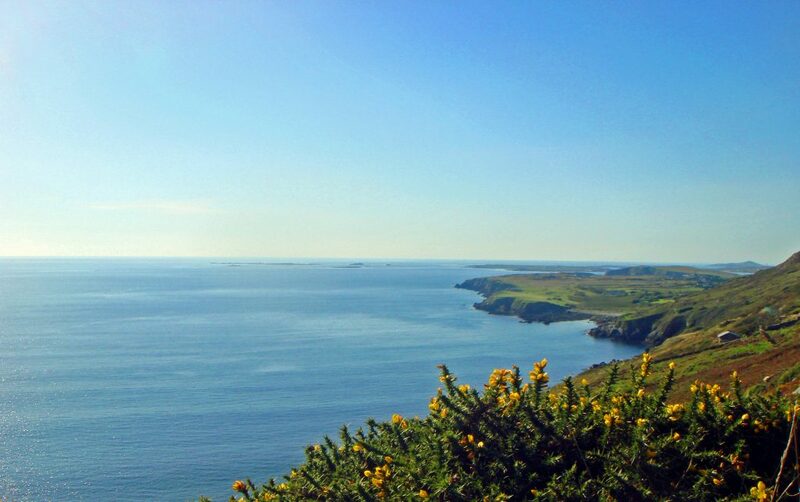 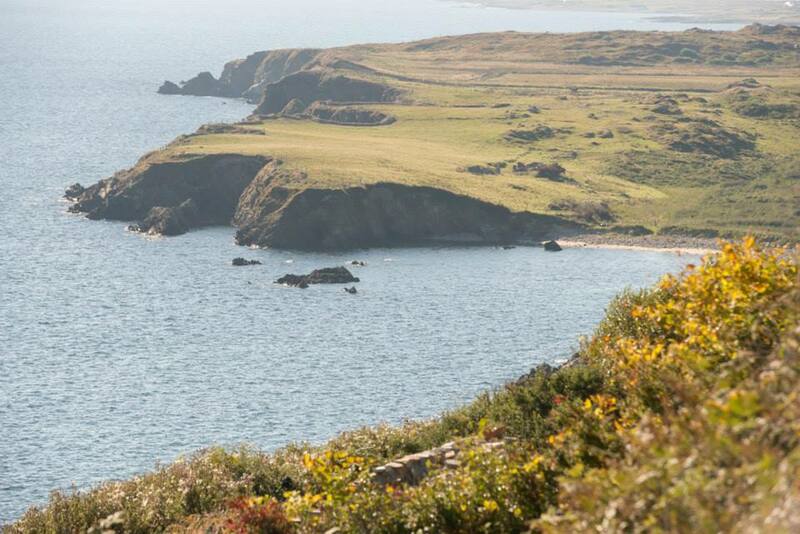 Fabulous walks and cycle routes reveal amazing pristine beaches for swimming, windsurfing and kayaking. 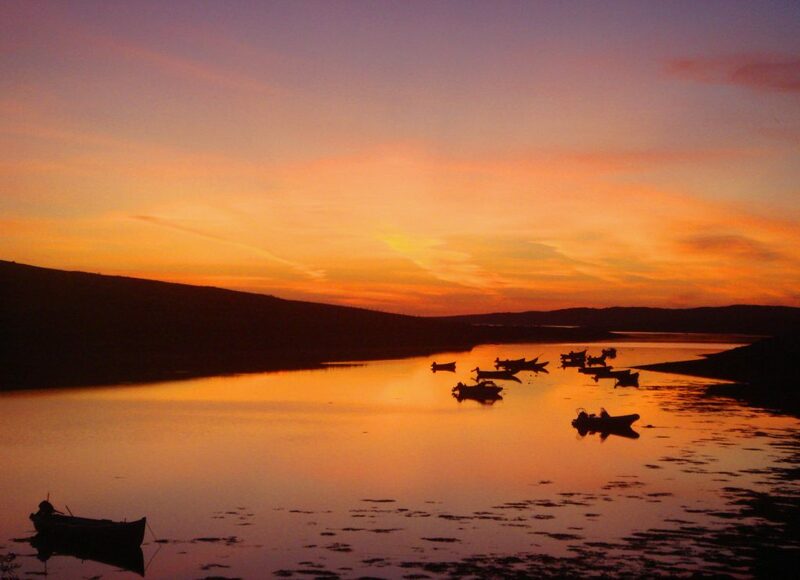 A Mecca for lake and river fishing you will be spoilt for fishy restaurants. 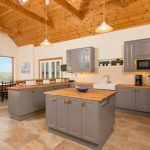 Please use the form below to make a booking query for our Self-Catering Lodge and we will confirm your dates as soon as possible. 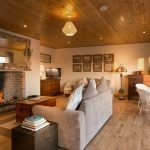 Please note, that the self-catering lodge has a minimum stay of one week during the high season (May-Sept) and is from Saturday to Saturday. 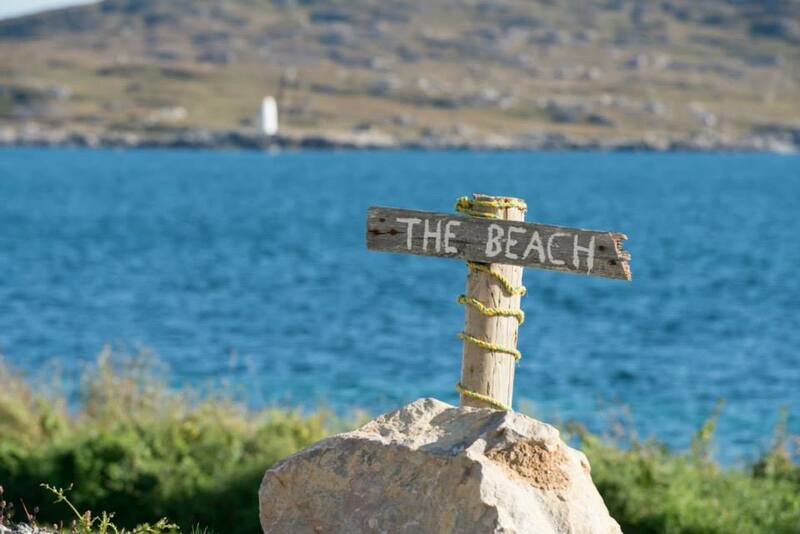 For all other queries please select B&B for nightly bookings or email us at stay@dolphinbeachhouse.com.